I spent last weekend in Prague, Czech Republic—a wonderful place. One of the most famous tourist attractions in the city is the Prague Astrological Clock or Prague Orloj built in the 15th Century. The clock was a remarkable feat of engineering in its day for its multiple features, including a display of the position of the sun and the moon, and a monthly calendar. As I rode through Prague’s Old Town Square on my excellent bike tour my guide enlightened me about the clock’s dark history. Some historians dispute this story, but who knows what information you can trust these days. So lets embrace the juicy story of this clock, as told by my Czech tour guide. Clock Master Hanuš built the clock, commissioned by the councillors of Prague. Master Hanuš was an engineering visionary for his era. People of the time may have seen him as a Steve Jobs type figure. 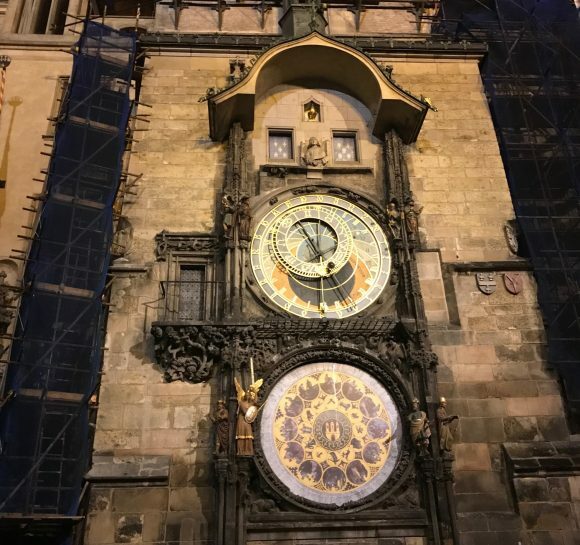 The fantastic clock helped Prague grow into a hot tourist attraction—much like it is today, minus the club scene and centuries-old Jewish cemetery. Unfortunately, the mayor of Prague became paranoid that the clock master would be recruited to build another fantastic clock in a different city. A competing clock in a another city could hurt Prague’s tourism business, so the mayor took drastic action. To prevent the clock master from building any new clock towers the mayor hired an anonymous henchman who gouged the clock master’s eyes out and cut out his tongue. The clock master then holed himself up in an apartment for many years, helpless and dejected, until one day someone divulged to him that the mayor had been behind the abduction. The clock master vowed revenge. Killing the mayor would have been difficult for a blind man with no tongue, but he had a better idea anyways—an idea that would have a more dramatic and lasting impact. Clock Master Hanuš committed suicide. He jumped off the top of the tower into the heart of clock’s mechanical innards jamming its mechanisms and disabling it. It would take a century before a new clock master finally repaired it. Question 1: Have you ever wanted to destroy a machine? Question 2: Do you prefer wearing a watch? i have had some machines that were not my favorite, but, i have never considered jumping off the roof into any of my machines. In my earlier working career as a plumber I had a boss who took an ax to his computer out of frustration. I have had some machines I didn’t like but never considered sabotaging them. I am in the process of cleansing our warehouse of drech machines and parts left over from 70 years of collecting screw machines and other mechanical animals. They will be melted down or used by somebody else but they will not be in my vision or on my books. I have always been able to deal with clutter, but this feels good and overdue. It isn’t sabotage, it’s a release. My basement and closets next. Can be pretty satisfying to load a problem machine on flatbed headed to scrap….. I broke. Now whenever I feel like destroying a machine. I grab a 1 inch bar of steel, go to the scrap metal room and take it out on a drum of scrap metal until i feel better, Then i go back to the machine, tell it I am smarter than it is and figure out how to make it do what I want it to do. Being in Acme rebuilding & service business has certainly presented some Very fustriated times but the problem usualy lies in the last thing you did or someone else did or changed that last workerd on the mnachine. We were called for service to a plant in Oregon once upon arrival we ask what was done to the machine last before it stopped? they replied we changed a cam follower roll and pin and cam. Upon investigation we found the cam & guard had too small a track between them so the roll would not pass between therefore stopping the machine from cycling. The machine was down for over a week! !